Having a new born is a good reason to start using headphones for your guitar practice. It is not ideal but given the situation, it is the best to not piss off the wife while still being able to noodle on the guitar. Yamaha Thr 10 gives one of the most convincing audio output from a headphone jack. I didn’t recommend it in my article on the best amp with headphone jack due to its price. However, if you have the money and want the best, the Thr 10 should definitely be on your list. The best headphone for the Yamaha Thr 10 is the AKG k240. It produces very natural sounds, without distorting the frequencies from the amp. It is also comfortable to wear and best of all, will not cause a big hole in your wallet. Value for money, this is the headphone to get. Recommending an ideal hearphone is always going to be difficult. We all different ear shapes and preferences so I am also going to give you other models to consider. Don’t buy this headphone if you want sound isolation or rumbling bass. Outside of these 2 weakness, the rest of the what the Akg k240 is near damm perfect! Combined with the power of the Yamaha Thr 10, you will not feel you are missing anything with the headphone setup. 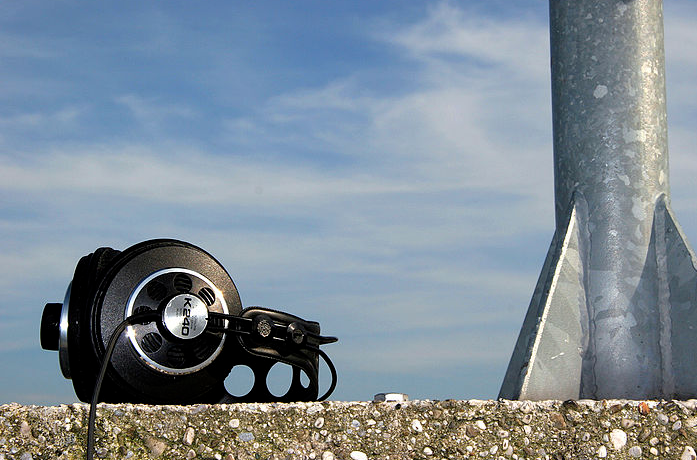 The most important factors to is an even sound and comfort, which Akg k240 performs very well. In the audio department, Akg k240 does not emphasis any frequencies so it is pretty close to what you can hear naturally. It has bass but not over powering. It also has a bright tone but not covering the rest of the notes. Some folks use this for studio recording and I can understand why. If you want a headphone that conveys the natural sound of your guitar playing, this is the one to get. The Akg k240 also excels in the comfort department. The ear cushions as well as the headband are made of soft leather so you don’t get skin irritation from the headphones rubbing against it. It is also surprising light. For a studio recording headphone, I thought it would be heavier due to the bells and whistle inside the device. Fortunately it doesn’t weigh much so your ears wouldn’t get tired after using them for long hours. Another good thing about the AKG k240’s design is the way it cups your ear without having to adjust the locking section that many other headphones come with. You simply hook the headphones over your ears and its spring design will get to work. Finally, the AKG k240 has an semi open design, which is why it doesn’t do sound isolation well. However, this allows air to flow more freely, resulting in your ears not getting warm after extensive usage. Grado SR80e: This headphone is about twice as expensive as the AKG k240, which is I didn’t choose it over that model. Audio wise however, it is very very good. When you listen through the Grado SR80e, you will experience a full depth of sound, with the bass coming in very strongly. In terms of guitar playing, you will get very clean and accurate representations of the sound. The lows, for example will be crystal clear while the highs are smooth and not ear piercing. There is however a weakness in the ear cups design. They tend to twist around so you always have to make sure they are in the right spot to avoid damaging them. This can be a bothersome sometimes. In terms of noise isolation, they suffer from the same issue as the AKG k240. These headphones are meant to be used in doors. If you used them outdoors, you will also hear the surrounding noise, which will ruin the audio experience. ATH m50x: Sound wise, this is a high quality headphone, with an unbiased output. They will expose any device for what it is truly capable of producing. In other words, you will get the best from your Yahama Thr 10’s amp as this headphone doesn’t reduce the mids just to create emphasis on the highs and lows. In fact, the sounds can be so detailed that it will expose flaws in your guitar playing very very easily. Despite the quality audio, I didn’t purchase it due to the high cost. Some of you might think a $150 headphone is not that expensive but to me, it is 3 times the price of a AKG k240. I didn’t think the quality is so high that it justifies the 3X difference in pricing. In addition to the price, there are other negative things about the ergonomics design of the ATH m50X. One thing is the clamping force. While this will differ between people, I have seen quite a reviews saying they were too tight due to the strong clamping force. As such, I strongly suggest you try one out physically before making the purchase. Another design problem is the ear pads. Their pads are made of fake leather and can really heat up or get uncomfortable after hours of using it. I suggest getting a replacement ear pad if you intending to buy this. If you want something comfortable that has a neutral output, that can last and wouldn’t cost you a bomb, then AKG k240 is my top recommendation. They cost around $50 but gives you good audio and you can use them for longs. However, if you are an audiophile and wants a studio monitor quality headphones then the Ath M50x is a good alternative. Do note however, it is expensive and is not as comfortable to wear as tehe AKG k240x.